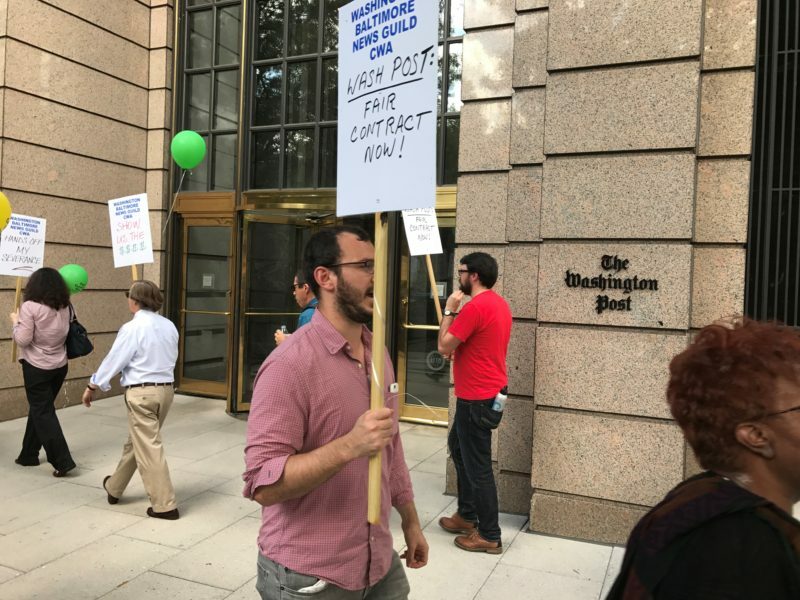 Washington Post union members picket demanding a first contract (Mike Elk). Washington, D.C. — In 2016, Jeff Bezos, the CEO billionaire owner of Amazon and the Washington Post, closed the paper’s historic headquarters on 15th Street made famous by the film All the President’s Men. In a symbolic move, Bezos opened a new state-of-the-art office on K Street in downtown Washington, D.C. The new headquarters was seen as a positive sign of the changes occurring under Bezos and his attempts to make the Post more competitive in the digital age. By all accounts, both union and non-union, Bezos’ investment in resources and in hiring hundreds of new reporters and multimedia specialists made the Post profitable once again. Today, Bezos was met with the first picket line outside his new headquarters as more than 50 union members demand a fair contract, while the two sides are locked in a tough contract battle. “[The] company is now making money. We have captured so many page views that we are getting up into CNN territory,” says Washington Post NewsGuild Unit Co-Chair Fredrick Kunkle, a transportation reporter. The Post is demanding that the union accept contract language that would require employees to sign away their right to sue in order to receive severance. Under the current contract, workers at the Post are allowed to receive severance and still maintain their right to take the company to court for wrongful termination. While only a small fraction of workers pursue private right of action over firings at the Post, the threat of action often helps workers get severance packages much larger than those stipulated in the Post’s current contract language. By denying workers severance if they want to sue, management at the Post would be given additional power to fire whomever they please, according to the union, as recently fired workers strapped for cash may be tempted to take severance in order to meet immediate needs instead of taking the company to court. Some fear the new severance language could open the door for the purging of union activists. Recently, Kunkle himself was formally reprimanded in writing and threatened with firing for writing an op-ed in the Huffington Post criticizing Jeff Bezos’ management practices at the Washington Post. According to the Huffington Post, prior to publishing the article, Washington Post Deputy Editor Tracy Grant met with Kunkle and informed him that they would not allow him to do so. After its publication, Grant formally reprimanded Kunkle. The union has filed an unfair labor practice against the Washington Post with the National Labor Relations Board. The action taken by management against Kunkle has mobilized many members at the Post. The fight between the Post and its union represent a turning point in the media politics of D.C., where more than 2,800 journalists are employed, according to the Bureau of Labor Statistics. Graham’s near-icon status as the newspaper publisher that took down Nixon during the Watergate scandal enabled her to persuade famed journalists like Bob Woodward to cross the picket line in 1975. Graham was viciously anti-union, even, at one point, using a helicopter to fly scabs onto the roof of the Post’s building to get them to the office. Later, Graham successfully pushed a union contract on the Newspaper Guild shop, which forced the publication to become an open shop despite D.C. being a union-shop city. For decades, being pro-union was not popular in the newsroom at the open-shop Post or in the many newsrooms located in the nearby “right-to-work” Northern Virginia suburbs. As a result, the Post bled members, while young, digital-savvy journalists bought management’s line that the NewsGuild was hurting the paper’s profits by resisting digital innovation. At the end of the Graham Family’s ownership of the Post in 2014, slightly less than 40 percent of workers joined the union. “I would say that, a few years ago, the rap was that we were getting all these younger employees, that they were disaffected and didn’t understand the union movement,” says Kunkle. One of the highlights for Kunkle has been seeing young women emerge not just as leaders in the newsroom, but also in the union. In the lead-up to the contract fight, the union has begun gaining members. In the last 6 months, the union has gained 80 new members at the Post, growing to an approximately 900-person bargaining unit. The increase in union membership comes at a time when digital media unions are becoming more popular in the industry as a whole; over the last two years, more than a dozen digital media outlets have organized, and unions have won first contracts at Vice, Huffington Post, and Gizmodo. “I think there are some young people who are not as informed—as they maybe haven’t worked in an unionized newsroom before and they don’t know as much about how it works,” says Zauzmer, a religion reporter at the Post. Young activists at the Washington Post say a delicate balance is being walked by many to not appear opposed to the type of digital change that has led the Post to rebound. The showdown at the Washington Post will prove whether Bezos is truly taking the Post in a new direction or simply behaving like the print bosses of the old days. Full Disclosure: Payday Senior Labor Reporter is an associate member of the Washington-Baltimore NewsGuild. In 2015, he was illegally fired for union organizing as the senior labor reporter at Politico. The News Guild has no editorial control over Payday Report. All articles are independently approved by Payday. Donate to help Payday continue to cover the struggle for a fair contract at the Washington Post. 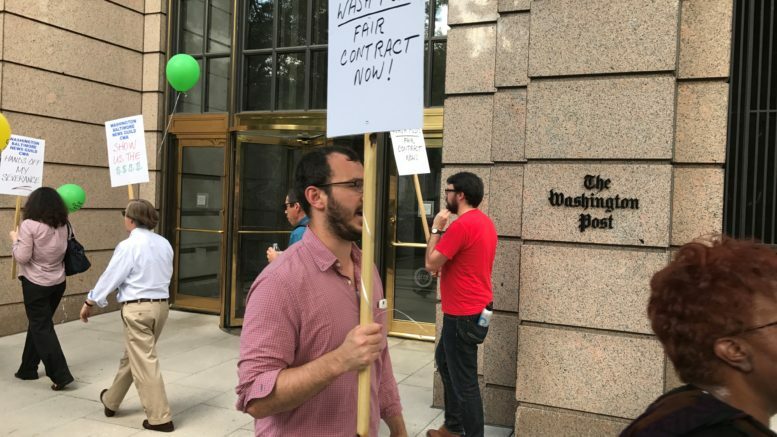 Be the first to comment on "Union Members Picket Washington Post Demanding a Fair Contract from Billionaire Owner Jeff Bezos"